It was just a few days ago that Mahjqa (Peer Kreuger) [1, 2] published his LEGO Motorized Tachikoma or Ghost in the Shell (GitS), at EB and Flickr. This was Majh's entry for a challenge (Marchikoma 2012) raised by curtydc in his Flickr Think Thanks group. "Think Tank" is a slang term used to describe a robotic weapons platform that makes use of artificial intelligence to enhance its abilities. In the Japanese version, they are officially referred to as "multi-legged tanks" . These are part of the anime and manga series Ghost in the Shell which takes place in a cyberpunk version of Earth in the near future, featuring several significant advances in technology. 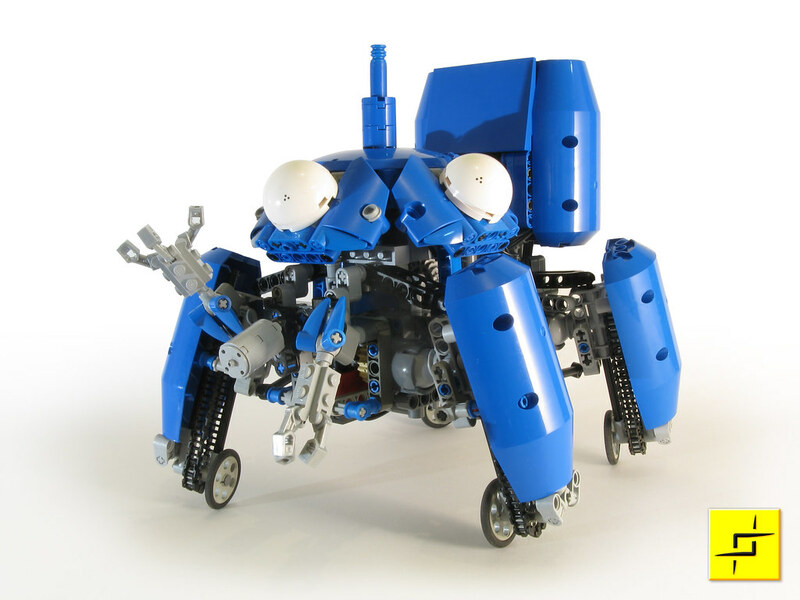 Tachikoma is one of those Think Tanks (along with Fuchikoma, Uchikoma,...). It is a fictional multiped mecha, walker/roller in the Ghost in the Shell universe and they are spider like multi-legged combat vehicles, equipped with artificial intelligence . The GitS universe was made popular in the late 90s, by the respective Playstation 1 game. Now that you know what we're talking about... let's see the creation itself, inspired on the characters above mentioned. Peer has put too much of his geniosity in this model, by providing several and complex functions, fully packed in a compact and relative small space. It can roll, walk, steer, roll its eyes and maneuver the mouth gun. As usual Peer made awesome photos and video footage from his model. And now because of the tremendous success this model is doing (namely in Japan), he also added it as an idea to LEGO CUUSOO. In just about 24hr this idea managed to gather well above 800 supporters. How much more it will take to reach the 10.000 votes required to be considered by TLG for mass-production? I know there are many other fan's models made by great Technic builders out there, which may deserve the same attention as well. However it would be even harder to focus energies at several fronts if we want to succeed and collect 10.000 CUUSOO supporters. So lets focus in one at a time (if you do not agree with the strategy... see also other Majh CUUSOO projects here - The Metal Grudge and Stilzkin Bridge Launcher). I'm also very curious to see how the LEGO Technic designers would take such idea and which modifications they'd introduce. One for sure would be the replacement of the old LEGO 9V micromotor. Would it be enough for us to finally get a LPF S-motor. Let's give it a chance by continue supporting this project! We can help it to become a dream made true, while we simultaneously test the power and size of the LEGO Technic fans community (not alone hopefully)! Click the CUUSOO logo below and leave your support! If you are not yet registered, just do it. It won't take more than a couple of minutes. 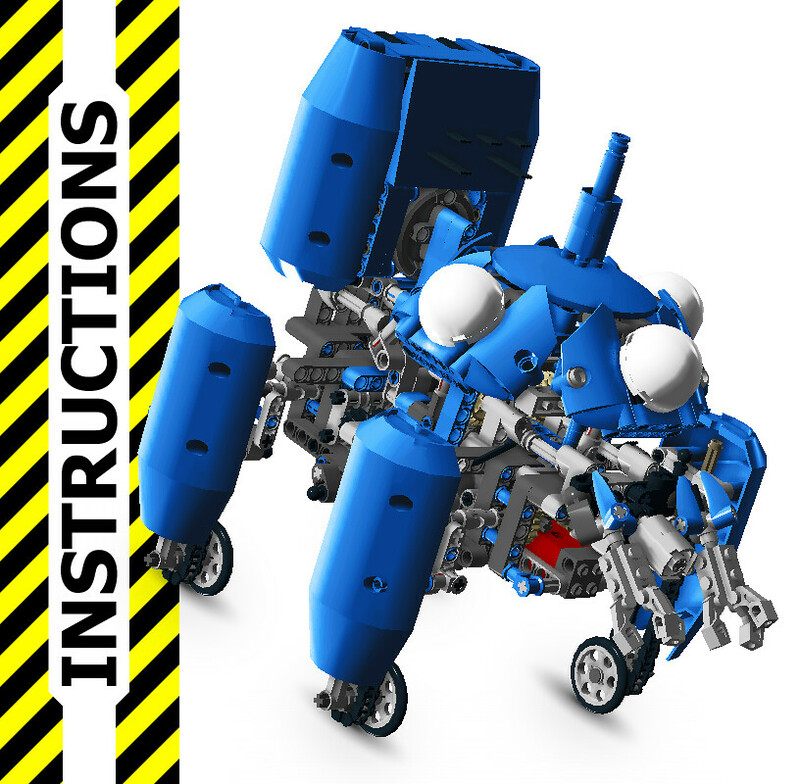 In the meantime if you can't stand the wait, you may also try to build your own copy by following the LDD/LXF file from here or from Rebrickable. And don't forget to spread the CUUSOO word!! This would be awesome! However, I bet the Cuuso people do not have the ability to design heavily motorized Technic models! They'd probably end up releasing a non-powered version. If we want to get this model "Cuusoo-ed", we HAVE to get votes outside the AFOL-community. So we have to get somebody to promote it on TV or on well-read (Non-Lego) blogs. Stil: It has my vote! I don't know what the Cuusoo project can or cannot do. That's why we try. And yes, before it goes in production there will be some changes, for buildability and parts that may not be available. I'm OK with this. As a matter of fact, I'm very curious what the official technic designers have to say about this. As far as I can tell, with previous Cuusoo projects, the original creators have been involved in the final design. I don't think this will be different. Due to my studies, I don't have much time to promote this. So thanks, Fernando. And to anyone else who reads this, please promote it where you can. Every vote helps. It gets my vote! As of now, it already has more than 1000 votes, which is quite impressive for being in Cuusoo just a couple of days! But anyone can support as many projects as they want! If several well-liked Technic models reach the magical 10K at the same time, that doesn't mean TLG will consider only one for production; the worst that can happen is they produce only one at a time, with a few months (or, dare I say it, years) between each one. Oh, and I forgot: even though I am supporting the support the Tachikoma, my favourite of Mahj's models on Cuusoo is undoubtedly the Stilzkin Bridge Launcher: not only it is based on real-life vehicles, but also is a kind of model TLG has never produced before, teaches about structural rigidity and lightness, and should be lots of fun playing around, laying bridges and driving other vehicles across them.